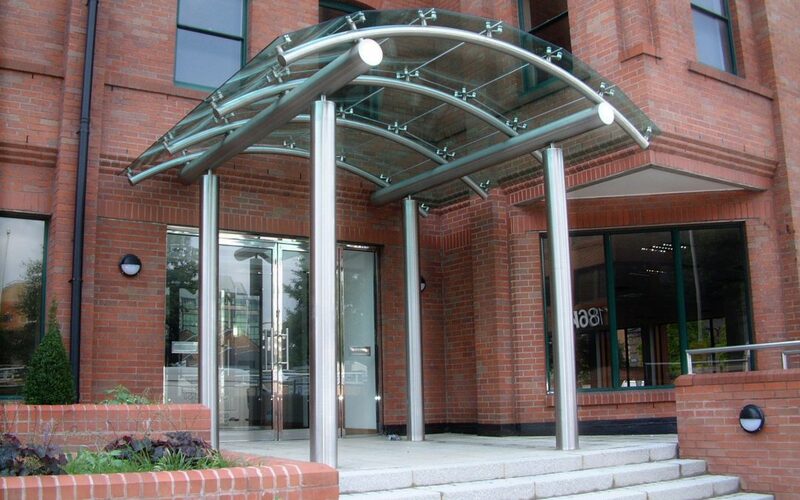 Glass canopies offer numerous advantages to commercial and domestic entrances and are very practical for use. A canopy to an office entrance can provide protection to harsh weather elements as you fumble for door keys or even be the much-needed dry area for visitors or customers who are in line waiting to be served. Canopy glasses used for commercial glass entrance have another use altogether, and that is complimenting the aesthetics of a place. Commercial glass entrance designed as canopies in buildings today are the epitome of modern architecture, they scream luxury and are an indication of quality. A glass canopy gives a striking appeal to several types of entrances that would otherwise be let down by any other type of lesser materials such as plastic and polycarbonate materials. Glass canopies provide the wow factor and set a certain tone and mood to visitors making them linger just a little bit longer at a premise. The aesthetical value of commercial glass canopies is so appealing that customers are drawn to the doorway and are left with a permanent first impression of what grandeur and design are all about. Glass forming and forging technologies go back to the eighteenth century and have changed at a fast pace. The changes in technology are expanding the sculptural and functional possibilities of this wonderful material. The built environment is ushering in a utopian design and feel of built infrastructure as hot and cold glass bending methods evolve. Glass bending technology and methods allow architects material repertoire to expand and invite light to our entrances in ways that one would think to be utterly impossible. Glass is very different from most other materials. Scientists regard it as a liquid structure in solid form, and this presents several challenges in accounting for its strength and technologies to bend it. As glass differs from so many other materials at the molecular level, it handles stress very differently and its response to the application of a bending force is breaking and failing. Due to this unique nature of glass, its strength is not accounted for in bending processes; its strength is statistical in nature and engineers calculate the possibility of glass breaking in forging processes. These properties come in hand to determine the possible utility of glass in varied architectural settings. Commercial glass canopies are tempered either chemically or thermally, and this process makes them surprisingly strong in bending processes. Such processes make it possible to use the glass in a variety of structures. When glass is subjected to heat in a bending process, microscopic cracks appear on the surface, and its strength is at that point as good as its weakest crack. Tempering the glass works by tightening the microscopic cracks by putting the surface of the glass on a compressive stress and the inside to a tensile stress. Bending glass can also be done by lowering the temperature of the material, and this can be done on the building site at temperatures that are relatively low, at times room temperature.